하나님의 부유하심은 어찌 그리 크십니까? 하나님의 지혜와 지식은 어찌 그리 깊고 깊으십니까? 그 어느 누가 하나님의 판단을 헤아려 알 수 있으며, 그 어느 누가 하나님의 길을 더듬어 찾아낼 수 있겠습니까? 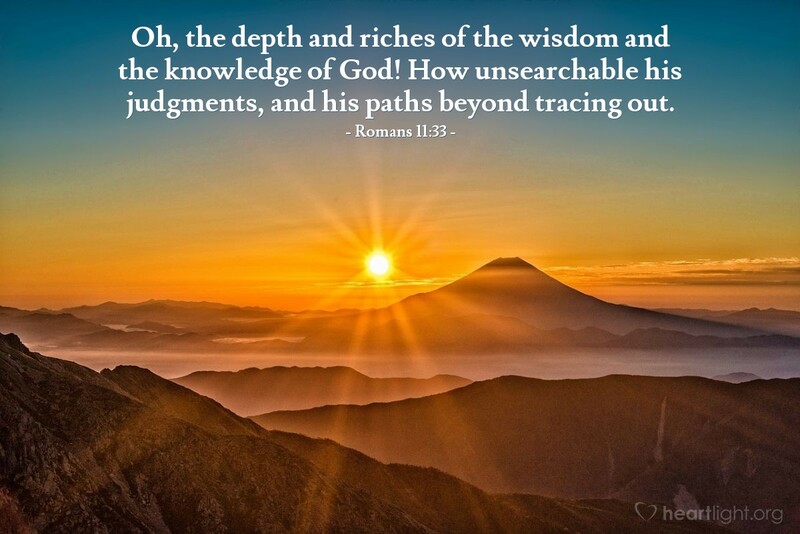 Oh, the depth and riches of the wisdom and the knowledge of God! How unsearchable his judgments, and his paths beyond tracing out. 하나님께서 우리를 구하시려는 계획은 믿을 수 없을 만큼 놀랍습니다. 우리 우주의 창조물들에 대한 그분의 계획도는 우리의 상상을 뛰어넘습니다. 그분은 지혜와 지식의 풍요로우심이 한이 없으신 분입니다. 우리 삶을 향하신 그분의 일하심과 그 뜻에 대해 우리의 마음을 열고 여쭤보는 것외에는, 달리 해볼 수 있는 것이 없겠지요? God's plan to save us is incredible. His blueprints for the creation of our universe are beyond our imagining. He is so rich in wisdom and knowledge. What else can we do but go to him and ask him to open our minds to his work and his will in our lives. 소중하시고 전능하신 아버지, 이 세계를 붙드시는 임재하심의 능력을, 매해의 봄이 될 때마다 새롭게 깨닫게 해주시니 감사드리고, 제 삶을 붙드심에 더욱 감사를 드립니다. 오늘 제가 모든 일을 함에 있어 아버지를 가장 먼저 찾고자 하오니 축복해 주시옵소서. 예수님 이름으로 기도합니다. 아멘. Precious and Almighty Father, thank you for reawakening me each spring to the power of your sustaining presence in the world, but even more in my life. Bless me today as I seek to put you first in all I do. In Jesus name I pray. Amen.